Mail for Mac includes an optional Junk mail filter, which attempts to filter out and isolate spam messages so that they don’t clutter your email inbox. The junk filter can be helpful for some users, but it can also be overzealous from time to time, and you may find yourself with erroneously flagged emails appearing in the Junk inbox when they should be in the regular email inbox. A simple solution to this problem is to disable the junk mail filter in Mail for Mac. Whether or not you want to disable the junk filter on Mail for Mac is up to you and how much spam or garbage email you get in general. Keep in mind that most ISPs and mail providers have some degree of server-side spam filtering for their email accounts, and so having an additional local client-side spam filter for email is not always necessary. For example, if you use Outlook, Hotmail, Yahoo, or Gmail, each of those services has separate spam filtering that will occur before the email messages will even arrive to your local computer, assuming those email accounts are added to Mail app on the Mac. Your junk mail inbox should be empty when finished, and emails should no longer arrive and be marked as junk by the Mail app in Mac OS. One decent strategy for managing junk email is to use multiple email accounts for different purposes. For example, you could create an iCloud.com email account and use that email address exclusively to sign up for online shopping or other similar activity, but have a separate email for personal communications and important information, and a separate email for work. Granted, managing multiple email accounts is a bit more advanced, but it can be helpful in many situations, just be sure to set the default email address if you go that route. You can always delete an email account from the computer if you later decide it’s too much of a hassle. 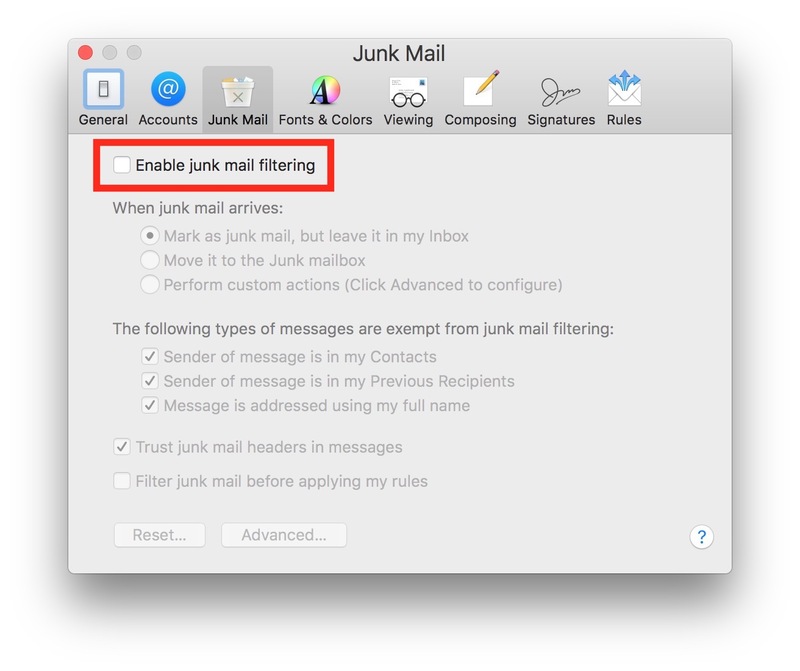 Remember, you can always re-enable the junk filtering in Mail for Mac again by returning to the preferences and adjusting the junk filter as suited to your needs. So if you try this out and find that you end up with a lot of garbage in your inbox, it’s just as easy to turn junk filtering back on again. Is there anything similar for iCloud email on iPad & iPhone? iOS does not seem to have spam filters but iCloud has server spam filters. I went into Settings for Mail on iPhone and found nothing of the sort for the iOS itself. 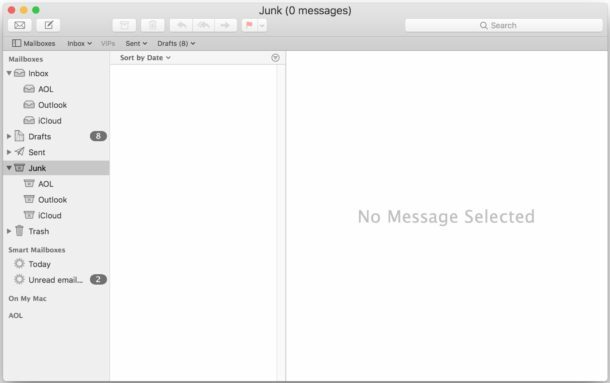 For the Mac, is there a better way to move from junk to mailbox? I get emails from Amazon flagged as “junk” when they are most certainly not, they are order confirmations and so forth! I didn’t even realize it until I checked the junk inbox and found a lot of emails in there! Lesson for all; check your email junk box because it probably has real email in there too!! iCloud email filtering has zero options for whitelisting or blacklisting senders. It has no feedback loop or digest showing what was blocked just in case it nabbed some ham. I can’t use iCloud email because of this – I’ve missed too many emails that never showed up in my inbox or junk mail folder – they just never arrived and the sender never got an NDR. One of many Apple services that need just a bit more work to be useful. The junk filtering is so effed up now that even mail that I send to myself is marked as junk. It used to work well but, at some point, it’s gone haywire. I get a lot of false positive emails as well, so I turned off junk filtering but I still have to check the Junk folder and routinely find receipts for online shopping in there. Frustrating. But then again, my Gmail account also flags family member emails as spam while solicitations from foreign kings/queens/princes in foreign made-up countries with terrible grammar make it through… almost like everyone gave up on spam filtering progress. Probably no revenue in filtering it out so they don’t bother anymore. Just as the thumb down marks emails as junk the thumbs up should remove the junk status of the email address if working correctly in macOS. It might require the email address be in the address book but I’m not sure about that. In iOS Mail the only junk folders are on the server side of mail and not stored in the device. My iPhone was my “Therapy Phone”. But I converted it this week to a “Tac iPhone”. I am the coolest kid on the block now! I have unchecked ‘enable junk mail filtering”, yet I still get mail filtering to the junk folder. And I do get false positives. Any idea how to completely stop the junk filter from working? I looked in iCloud.com to see if it was enabled there, but doesn’t seem to be.